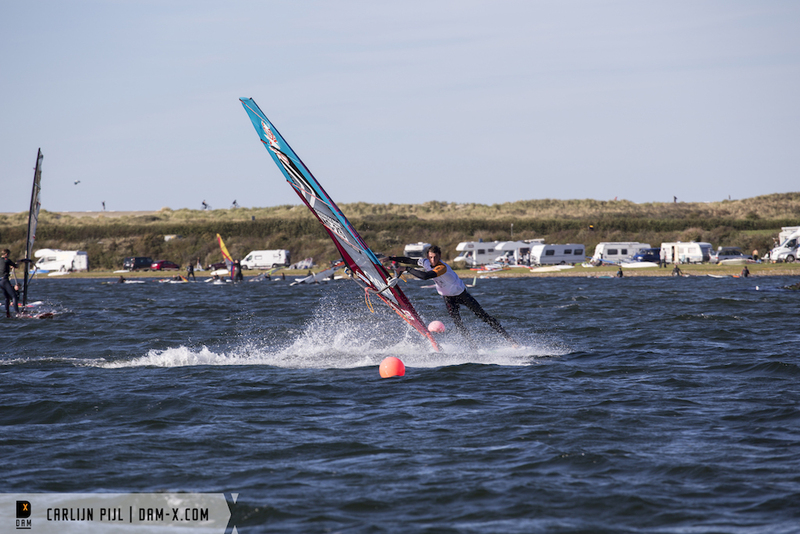 On the ultimate day of the DAM-X event the wind unfortunately never properly filled in and even though the double elimination has been started several times to see if the conditions were suitable, the competition had to be called off at 02.30 pm eventually. With €1.000,- prize-money up for grabs, a tow-in competition was staged right in front of hundreds of spectators. The best ten tow-in riders of the event were invited to participate. With two runs each and the best one counting, the sailors went big already in the first round. Mattia Fabrizi (Patrik) and Antoine Albert (Goya/Goya) went for perfect skopus, Tonky Frans (RRD/RRD) was going through big double air culos, but couldn’t quite make the landing. 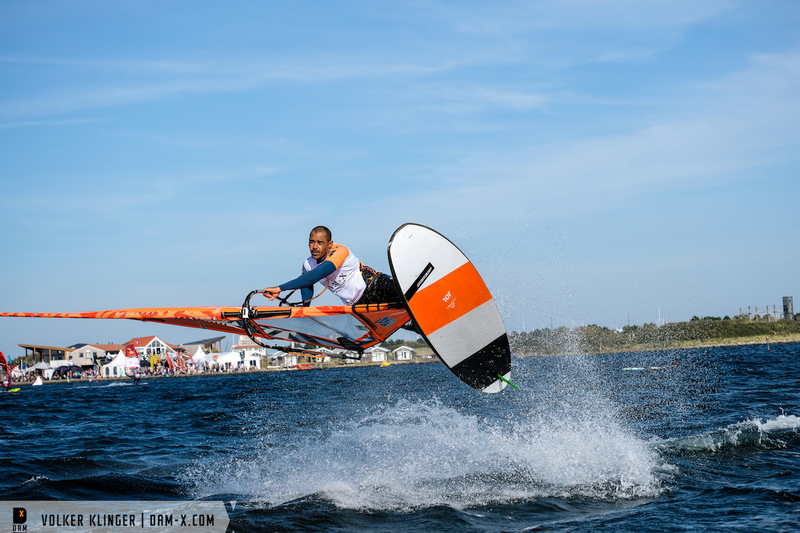 Julien Mas (Gunsails/JP) and Yentel Caers (JP) impressed both with a perfect air bob into culos, but couldn’t beat the score of Francesco Cappuzzo (RRD/RRD) who landed a clean and powerful double culo, that put him in the lead. Just Adam Sims (Sailloft/Patrik), who is known for his tow-in skills, could push Cappuzzo off the first place with THE perfect planing and stylish double culo. Just around 04.00 pm, when the beach was the filled up with people, the big prize-giving kicked off and the new European Champions were crowned. Tonky Frans has been the tourleader throughout the whole season. After winning the event this year in Neusiedl am See, Austria the Bonairean could not get pushed off the first place anymore. He chased the tour around the globe, stayed focused on his goal and secured his title with a 4th place at this event. The title of the Vice European Champion was awarded to Steven Van Broeckhoven (Gunsails/JP), who was incredibly happy about his podium position, that he didn’t actually aim for this year. The multiple European Champion proved that he will remain the one to watch out for in the upcoming season. Giovanni Passani from Italy finished in third place overall this year. The young Italian was one of the title contenders and has shown some great competition sailing throughout this season. Due to an injury that occured just one day before the EFPT Lanzarote kicked off, Passani had to stay off the the water and lost some valueable points in the run for the title, with some great results though in the remaining events he managed to stay within the top three. The first time in the history of the EFPT, the womens title has been awarded in 2015. Since that time, there was one woman who stood out to an extend that seemed to be out of reach for the other competitors – Sarah-Quita Offringa (Neilpryde). This year however was the first time, that another lady could beat the multiple World Champion and it was no other than local hero Maaike Huvermann (Severne). The Dutch lady is a title contender on both international tours for a while now. Huvermann put together some solid heats in tricky conditions, could win at her homespot and was crowned the new European Freestyle Womens Champion. 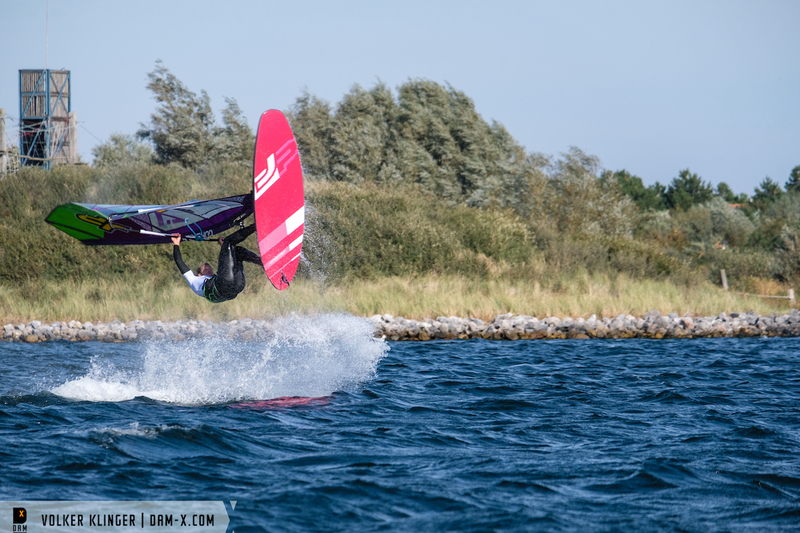 The Severne rider was beyong stoked to be the one, who takes the title this year, to win in front of a true windsurfing legend and to do this all at the place where she learned to windsurf and trained ever since. Placed second is Sarah-Quita Offringa, who struggled with the lighter conditions in competition yesterday. Offringa stated that she was extremly happy for her friend, especially because she could win at the place she calls home. Knowing the freestyle queen from Aruba though, she’ll probably be ready to fight back in next years ladies competition and we can expect to see the girls push even harder. Taking third place is Arrianne Aukes (Doutone/Fanatic), who is an extremly experienced competition sailor and who proved once again, why she is one of the top freestyle ladies worldwide. Taking the Champions title home is Corto Dumond (Severne) from New Caledonia. Coming on tour for the first time this year at the EFPT Fuerteventura, nobody knew the 15 years old newcomer. Corto competed in the juniors and pro fleet and was soon an opponent, that has been feared – not only amongst the juniors. After winning the contest in Matas Blancas, he could also take victory at the DAM-X and was crowned the first ever EFPT 16U Juniors Champion. Placed second and therefor Vice European Champion is Lennart Neubauer (Severne). The 14 years old became a regular in the international competition scene in the past years and is definitely one of the biggest talents in this sport at the moment. Third place overall goes to Stefan de Bell from Curacao. Stefan had been competing in the juniors and pro fleet from this season onward and demonstrated, just like the other juniors, the bright future of the freestyle discipline. With this competition being the only one with a junior girls division, the result of the event is also the overall result for the season. 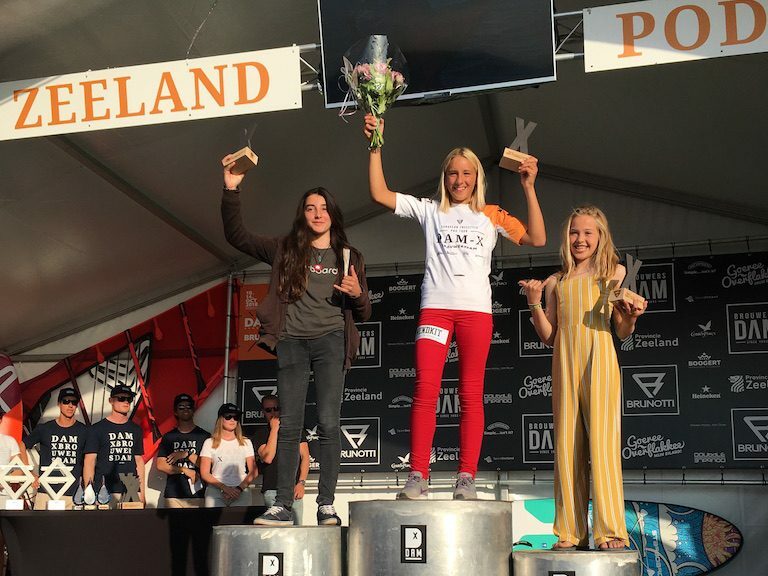 Winning the first ever junior girls title has been Lina Erzen from Slovenia, who impressed already in this years PWA event in Fuerteventura where she became Youth World Champion. There is definitely a lot of potential and we are looking forward to see more of this lady in the future. Second place goes to France. Salomé Fournier had a great comeback in the junior girls double elimination and put on a good fight against Lina Erzen. It is nice to see the junior girls getting a chance to display their skills and match each other in the same age category. Placed third is local girl Sterre Meijer, who also managed to win the expression session today. We are looking back on yet another great final of the tour, that was taking the crew and riders around all of Europe. It is a pleasure to see how the tour has been growing in the past seasons and how we could add more and more divisions. 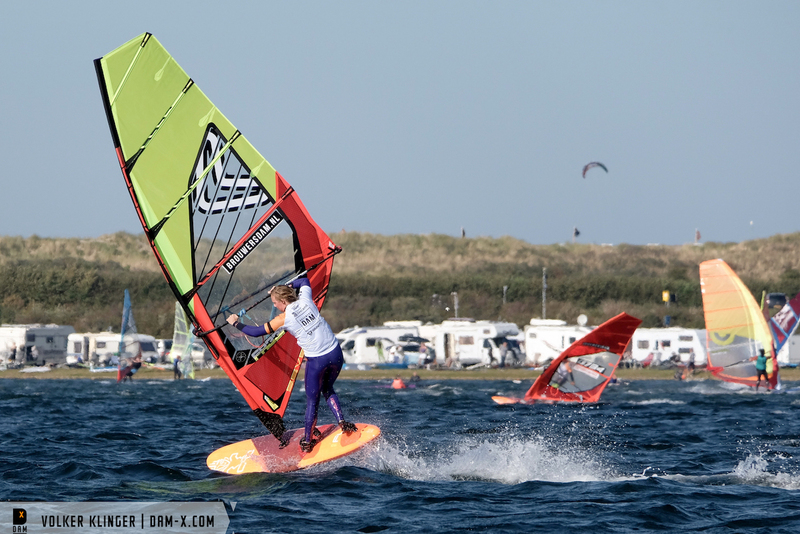 It is especially good to see the future of the sport and spots like the Brouwersdam prove that there are many young and motivated windsurfers out there. For now we hope to motivate even more juniors to enter in the upcoming years and to keep on pushing our favorite discipline in every possible way.